Dimitry Nikolaevich Nasledov was a great man. 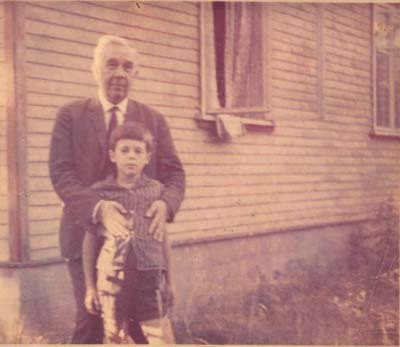 He was my great-grandfather. He was born August 12, 1903, in Kiev, Ukraine. During his life, he had accomplished many things. D.N. Nasledov finished Kiev University in 1924. For 6 years, he worked at the Ukraine Institute of Radiology. In 1930, he came to Leningrad (now St. Petersburg) and began working at the Leningrad Institute of Physics and the Polytechnic Institute. For years, he worked with electron semiconductors. He was experimenting with semiconductor elements combined from AIIIBV such as Arsenic-Gallium. Dimitry Nasledov was one of the fathers of the semiconductor laser. The discovery of the laser was in Spring 1961. For this discovery, my great-grandfather was awarded the Lenin's prize in April 22, 1964. Lenin's prize is the highest award possible for a scientist and it is given only on April 22 because that was Lenin's birthday. His works were widely recognized and respected in European countries like West Germany, France, and England, where he was invited to lecture. He was the Fellow of the Germany Academy of Science and Literature and the French Academy of Chemistry and Physics. 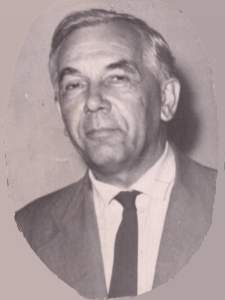 Dimitry Nasledov wrote eleven monographs and more than six hundred articles for scientific journals. He made many other discoveries in the field of semiconductors but none were as important as the discovery of the semiconductor laser. Some of his later accomplishments were a computer model of the Gunn diode and research on the magnetic field influence on the Gunn effect. Dimitry Nikolaevich Nasledov spent most of his life in Communist Russia (USSR). His life spanned from when airplanes and cars were just invented, to World War I, to the Russian Revolution, to World War II and the siege of St. Petersburg, and the space race. His students loved him and it was said that Dimitry N. Nasledov was the best lecturer in all of St. Petersburg. He was the scientific advisor of more than one hundred Ph.D. projects conducted by his students, many of which later became prominent physicists known all over the world. Dimitry spent his day by going to work at 10AM. At work he would spend a large part of the time thinking. Then he would talk with colleagues about work and physics problems. Sometimes he would have lab seminars. Twice a week he had lectures. He would usually go home at 6-7PM. My great-grandfather was very organized and serious about his work. His lab was very quiet and clean. Russia during the 1930s was a hard place to live in. During the 1930s, Russia, or the USSR, was under Stalin's rule, there was a totalitarian government. There was only a small elite group, mostly part of the government and communist party officials, that was actually treated well. During that time period, there was also World War II, the concentration camps, to which one could be sent for crimes he / she never committed, the siege of Leningrad, during which hundreds of thousands people died, and many many other tragic events. Fortunately, D.N. Nasledov and his family were spared during these horrible years, probably because the Soviet authorities realized the critical nature of some of his projects. He was married twice, my great-grandmother, Mirra Abramovna Kopelyanksaya, was his second wife, whom he married in 1932. Dimitry and Mirra had lots of friends; until their last days, their house was always full of people. My father told me that they were really heading and uniting all our family and it was never like that after they had died. During World War II, D.N. Nasledov was the head of the Physics department in the Communications Military Academy that was evacuated from Leningrad to Tomsk, Siberia. He had a military rank of Colonel. There he was teaching officers some physical military subjects. After World War II, he returned back to Leningrad where he became the Deputy Director of Science at Ioffe Institute and returned to being the head of the Experimental Physics Department at the Polytechnic Institute which he was heading for 40 years, overall. He had many friends and enjoyed life. He was between optimist and pessimist but more optimist than pessimist, but he understood that life had many very bad things in it. One of his colleagues was the person who was in charge of nuclear weapon studies in Russia. During the 1950s and 1960s, Russia, like United States, had a revival of creativity. During this era, Russia was the leading world power in technology and they were the first country to send a satellite into space and first to send a live person into space. In the end of sixties, however, due to crackdown of many democratic movements by Soviet authorities and partial revival of some Stalin era rules, Russia began losing its creativity and, as the first well noticeable result of that, the United States were the first to send a live person to the Moon in 1969. This era of revival was the most productive period in scientific biography of D.N. Nasledov. It was in the early sixties, that he and his team made most of their discoveries and the laser was created. Fundamental and applied research, conducted under his leadership, led to discovery of many new physical phenomena and creation of many new semiconductor devices. Today, there are not very many traces of his existence, and it is very sad. It is common belief that Bell Labs created the semiconductor laser but all they did was create a new generation of lasers, using idea of D.N. Nasledov's Laboratory and they do not even admit it. His student Boris Tsarenkov says that it took Bell Labs 5-6 years just to think about doing something and Bell Labs had no idea what the laser was until later. If one searches on the Internet for "Nasledov", he / she will most likely find only links to one or two pages with his name mentioned as a co-author of some old scientific article, most of which are written in Russian. There wouldn't be much information about his life. But it is no longer going to be like that, because I will publish this work on my home page, so that people may learn about this great person. I hope that some of his students will find this article and contact me or my father. Maybe they will send us some old photographs and copies of articles about him and we will gladly publish them on our web site. Unfortunately, during emigration to the USA, we couldn't take with us a lot of materials about D.N. Nasledov, but we hope that Internet will help us to fill this gap. His untimely death was caused by a heart attack in Leningrad on January 8, 1975. During first few years after his death lots of his former students were visiting his widow, Mirra, who passed away in three years. My father told me that her death was a final tragic event that greatly affected the life of our family causing it eventual splitting and our emigration to United States. Since his death, every year at the Experimental Physics Department of the Polytechnic Institute (which is called now St. Petersburg State Technical University,) there is a D.N. Nasledov memorial day where many of his students hold seminars in his memory. D.N. Nasledov was a great physicist and if not for his devotion to research of electron semiconductors, the world would probably be a much different place today. It is very sad, however, that today, after all the energy and devotion he put in his work, he is not recognized by most people.